The stories of the people all around us are what drive our lives. 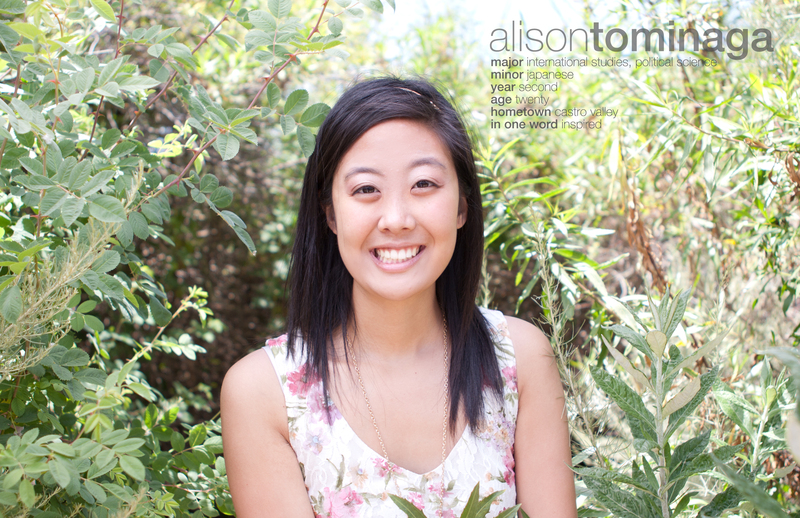 When Alison Tominaga hears these stories, she gains perspective of the people around her. These stories connect us, even internationally, and she really hopes for people over international waters to understand each other, as she’s passionate about bridging the cultural and language barriers around the world. Alison is currently working with a Japanese teacher on a digital program that teaches Japanese children English in an interactive way. She’s also thinking of ideas and insights to implement for her APSA Program Coordinator position in the fall, and also just looking forward to a relaxing and productive summer. 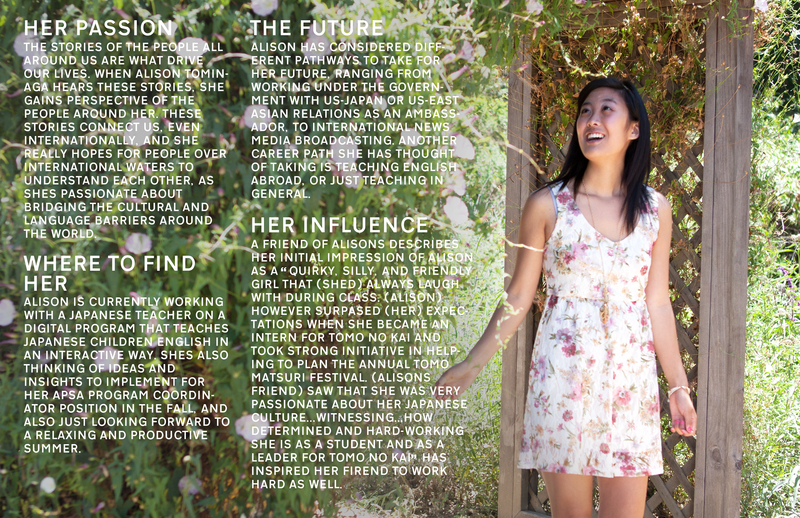 Alison has considered different pathways to take for her future, ranging from working under the government with US-Japan or US-East Asian relations as an ambassador, to international news media broadcasting. Another career path she has thought of taking is teaching English abroad, or just teaching in general. A friend of Alison’s describes her initial impression of Alison as a “quirky, silly, and friendly girl that [she’d] always laugh with during class. [Alison] however surpassed [her] expectations when she became an intern for Tomo no Kai and took strong initiative in helping to plan the annual Tomo Matsuri Festival. [Alison’s friend] saw that she was very passionate about her Japanese culture and wanted to work her utmost best to have the event succeed…witnessing…how determined and hard-working she is as a student and as a leader for Tomo no Kai” has inspired her friend to work hard as well. AT: I grew up with a very Japanese American background, and my parents didn’t speak any Japanese. I’m a 4th generation Japanese American, so my great-grandparents came from Japan. I went to a Buddhist church – I’m a Jodo Shinshu Buddhist, and I went to church every week. Also, I got involved by helping out within the community through JACL, the Japanese American Citizen League. I retain my Japanese culture through my family and my grandparents, who brought different traditions, like Girls’ Day and Boys’ Day, while at the same time I keep in touch with American culture. I grew up not speaking any Japanese. Where I’m from, the neighborhood was relatively Caucasian, so coming to college, I didn’t have that much of an idea of diversity. I was able to see diversity when I did an internship in San Francisco. AT: I was co-Director of Cultural Affairs for Tomo no Kai for this past year, and through that experience I was able to help plan our 25th Annual Cultural Night. I was also one of the main characters for the show itself, and I portrayed a youth who didn’t necessarily fit into society, and had to undergo a lot of different challenges and people who doubted her at times. Portraying that character to a huge audience and telling the story that our skit director wanted to tell was a really great experience. Being able to involve people from many different groups ranging from traditional Japanese dancing, to singing, and modern dancing and incorporating all those people into one big production, as well as seeing them all light up on stage was just amazing. Another accomplishment that I’ve made, also through Tomo no Kai, has been bringing in freshmen and making them feel welcome on campus. That’s one of my main goals – making people feel like they belong to some sort of community. Looking back, the community constitutes my roots and it is what has built me as a person. I also won the special award for the Japanese language program’s speech contest, and so I went to the Southern California division, and won second place for the advanced category. My speech content was about my grandmother’s stories – about her being a Japanese American, growing up impoverished, with many siblings, having to work on the farm, and build her dreams even through internment and those tough times. Being able to tell that story to an audience of Japanese speakers, people taking Japanese, and all those people was just an amazing experience, and those people actually came up to me afterward, saying that they wanted to know more about the Japanese American experience. A lady from a media broadcasting system even asked to interview me. That feeling that people are actually interested and want to know about our experiences is really amazing. I really want to be able to not only engage the Japanese American community, but also engage the Asian American community and other communities through the Cross Cultural Center, and also get involved in APSA and their events. I also have a position in Middle Earth next year, and I really want to continue my drive to engage the freshmen and make them feel welcome to this campus, and make them feel safe and that they have a place to talk to anyone about anything. I will be working at the International Center as well, so I really want to talk to International students, not only to tell my stories, but to hear theirs as well. In my experience of living in International Village this year, being able to hear their stories was really enriching and I just want to have that cross-cultural exchange to become more aware. AT: I was very involved with my Buddhist church, and our Junior Young Buddhist Association. I took on many different leadership roles, but apart from those positions,helping the congregation, whether it was through passing out meals to people, or creating a musical act to do, was a very good experience. Also, through that I helped out at bigger events, like their bazaars and fundraisers. I was able to gain more leadership experience, as well as increase my passion for the community itself. With JACL, I helped out making mochi, doing events, and helping out at basketball tournaments. Although these seem small, it really motivated me to go into bigger things, and help out the greater community as well. With Tomo no Kai here at UCI, we’re a Japanese / Japanese American social and cultural club, but we also do some community service too, like helping out at a fun run for little kids. It’s helped me see the Little Tokyo community as well. Last summer, I participated in this internship, Nikkei Community Internship (NCI). It’s a program that gets interns, college students from all over California, whether they go to different schools like UCLA, USC, UCI, or other schools, together. There’s three different programs within it –based in San Francisco Japantown, San Jose Japantown, and LA Little Tokyo. We were placed in non-profit organizations to help out. I helped out at JCYC, Japanese Community Youth Council, a non-profit organization that provides youth services for young people in the San Francisco Bay Area. It was very interesting, because I was expecting to be a camp counselor or something, but they had me become an intern for the fiscal administration – the people who are behind all of the programs. I helped to provide a youth perspective for the executive director and the higher-ups in the organization. It was really an amazing experience to help them out and see that they value youth perspective because they’re providing youth services. Although it’s non-profit, it’s still rewarding and it’s why they wake up everyday. It inspired me to get involved in my community work and spread that work to whatever I do. AT: My grandparents have had a really big influence on me. Although my grandfathers passed away when I was very young, just hearing their stories has really influenced and inspired me to work hard. Luckily, my two grandmothers are alive and well now, and I’m so grateful to have them here. Hearing their stories about internment and how they got through it is amazing. To point out one specific person, I would say my grandmother on my father’s side has had the biggest impact on me. She was the eldest daughter of about twelve children, and she went through so much. Her family was very poor, and they lived on a farm. I got to hear her stories, because I had to do an oral history project on people in the Japanese American community affected by internment. For my personal project for that internship, I interviewed my grandmother. She never told me those stories before, and so hearing it for the first time made me look up to her and really see what an amazing woman she is. I feel like everyone is amazing in their own special way. My grandmother’s family was so poor that during the war, she thought conditions were pretty good. They were able to have food on the table, bathrooms, and the simple necessities. She was unable to get a college education, because it was her senior year of high school when she was put into camp. After she got out of camp, her parents sent her out early because they struggled to provide for her. She had to move to Chicago, and work various menial jobs. Her independence and having to brave because she had to be brave really inspired me to work hard and get an education. Last year, both of my grandmothers came to UCI to visit me, and I heard that while they were walking around campus, they were so amazed and so proud. Hearing how they were so happy makes me driven. I have to succeed, and I have to give my all into whatever career path I choose. AT: I’m most passionate about connecting people in the international community. We can think of ourselves as Californians or Americans, but we can bridge the language barriers and differences in culture and religion, and bring everyone together, because in the end we’re all very alike. I learned this about four years ago, when I got to go to Japan on international youth exchanges. I did three different programs that were each about ten days, over three different summers. I was able to meet people from all over the world – people from America, Peru, Bolivia, Brazil, and Latin American countries, as well as Japan. To sum it up in one moment, we were all learning about the Hiroshima bomb museum, and we all had a good understanding of the impact of the bomb and nuclear weapons. However after that, we were all in the elevator, and one person started laughing. Although we can’t speak the same language, and we have to use hand guestures to understand each other, it seemed like after one person started laughing, other people started laughing too. Just that one universal thing – finding fun in that one moment – showed that we were all connected in that one moment. It gave me hope and told me that that was my passion. I want to make people understand each other. This is very big and ambitious, but if everyone was able to understand each other, all these big problems we see in the world today could be prevented. If we start little by little, that would make it better, and that drive to want to communicate with others in the international community is just what we need to start to take off and start a movement. KS: If you could have any superpower what would you choose, and why? AT: I would want to have the ability to name a place and be able to travel there. I want to travel the world, see perspectives outside of what I’m living, and to be there instantaneously, adapt to different situations, and meet different famous people. Also, with that sense, I would want the ability to travel to different places, but also included in that is the ability to travel to different time periods. This wouldn’t necessarily mean resurrecting the dead, but being able to talk to people who lived before and going back to the ancient days. That would be really interesting to see how they lived and how history really went down other than what we read in our textbooks because a lot can be skewed. Being able to see that first-hand would be pretty awesome.